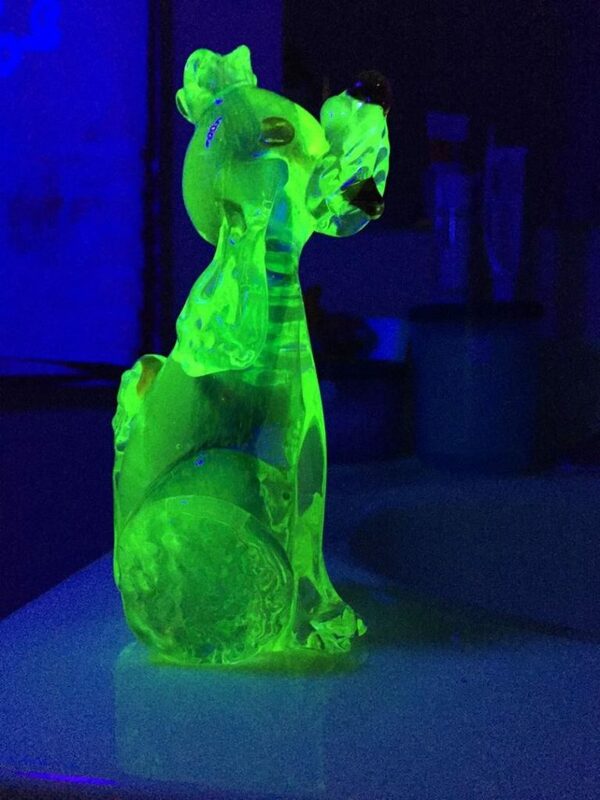 If it glows green under UV light, your glass collectible contains uranium. This gorgeous Vaseline carnival glass bowl sold for $3,050 in June 2017. It is the stuff of Cold War spy novels, of superpower negotiations, of “minutes to midnight” global destruction. And you just might have some of it in your kitchen cabinet. Found mostly in glassware, tableware, and decorative items primarily manufactured from the 1880’s to the 1920s, if it glows green under UV light, your teacup contains uranium. Yes, that uranium. The stuff of the mushroom cloud variety? Uraninite crystal, the main element for uranium glass, was added to the processing of glass for its distinctive coloring. Discovered as an element in 1789 by chemist Martin Klaproth, uranium was named for the largest new planet of the time, Uranus. 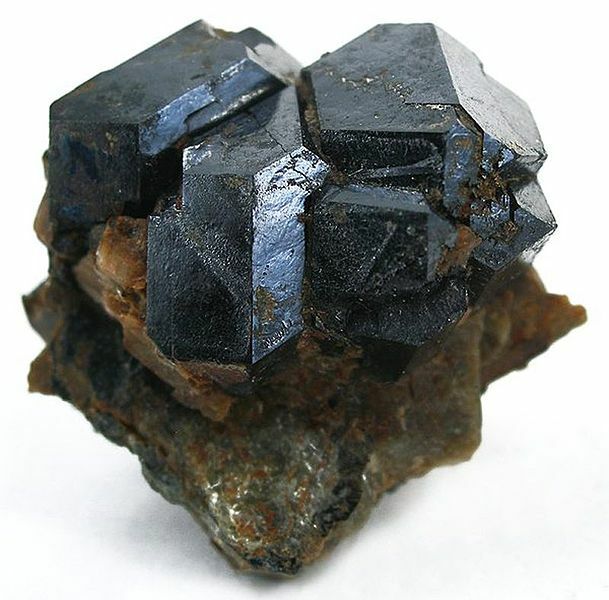 It was separated from pitchblende, now known as uraninite, an ore originally derived from silver mining in Germany during the Middle Ages. Then as now, it was added to the processing of glass for its distinctive coloring. Its ability to fluoresce as green under UV light only became known later. And it is this “glowing green” that made it such a collectible. Perfectly situated on a windowsill, for example, the sun at dusk or dawn will allow any decorative item containing trace amounts of uranium to light up as green or yellow, like a night light. It is this “glowing green” that makes uranium glass such a collectible. This beautiful pair of antique urns sold for $3,000 in July 2016. But is it radioactive? “…It’s not radioactivity that makes the glass glow,” says Naomi Marks, research scientist at Lawrence Livermore National Laboratory. “If it was that radioactive, you definitely wouldn’t want it in your home! The uranium fluoresces under UV light because the UV excites the electrons above the ground state and gives off photons as the electrons transition back to the ground state.” In other words, it’s the isotopes in uranium that are radioactive, but with processing, most of the radioactive isotopes are removed. This is known as depleted uranium. “In fact, there’s more radioactive potassium-40 inside each and every one of us than anyone could ever receive from handling, using, or just plain eyeballing a piece, display case, or entire museum full of Vaseline glass,” writes Ben Marks in These People Love to Collect Radioactive Glass. Are They Nuts? in Collectors Weekly, July 30, 2014. 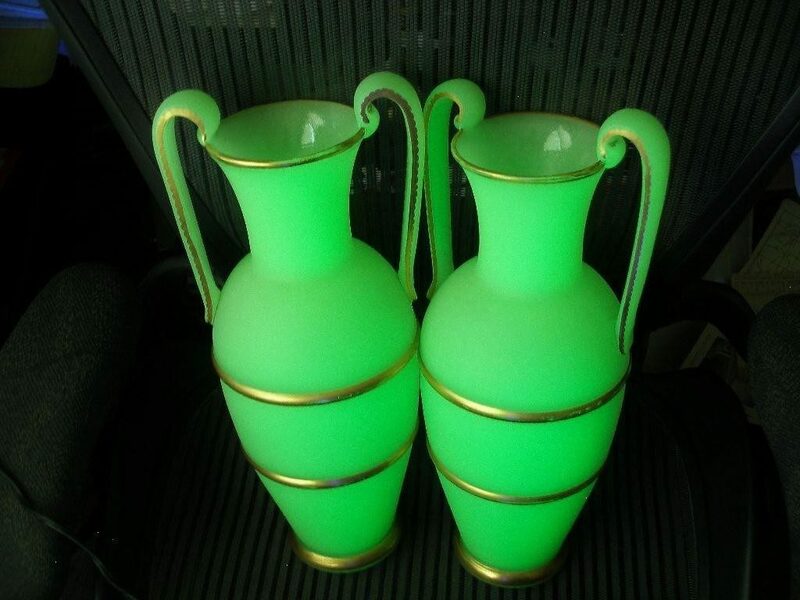 Having settled that, there is an entire collectible category of uranium glassware called Vaseline glass for its outward appearance similar to that of petroleum jelly, a dull, white, oily looking substance similar to the commercial products Vapo-Rub or Vaseline. But other collectibles contain uranium beyond just glassware, such as signage, lamps, lanterns, clocks, watches and even jewelry. Uranium glass isn’t new. It has been manufactured since early Roman times. In 79 A.D., a mosaic in a Roman villa contained 1% uranium oxide, according to the Wikipedia entry on uranium glass. European glass makers processed uranium oxide from pitchblende, starting about 1830 to the 1880’s when the glass was more opaque. By 1880, the glass took a more translucent color with addition of a new blend of uranium oxide. The Depression era brought about the more “Vaseline” look and by World War II, uranium was restricted for military use. There was a minor resurgence of uranium glass production in the late 1950’s, but mostly toward smaller decorative items. So, these are the different manufacturing periods of uranium glass. With the exception of uranium glass from the Roman period, it’s more likely collectors find uranium glass mostly from the 1880’s to 1920’s period. Shown here is an Alfredo Barbini sculpted uranium Vaseline glass candlestick that auctioned for $11,995 in 2017. Barbini worked as a master glassblower in the 1940’s and 50’s. So what is the value of collecting uranium glass? 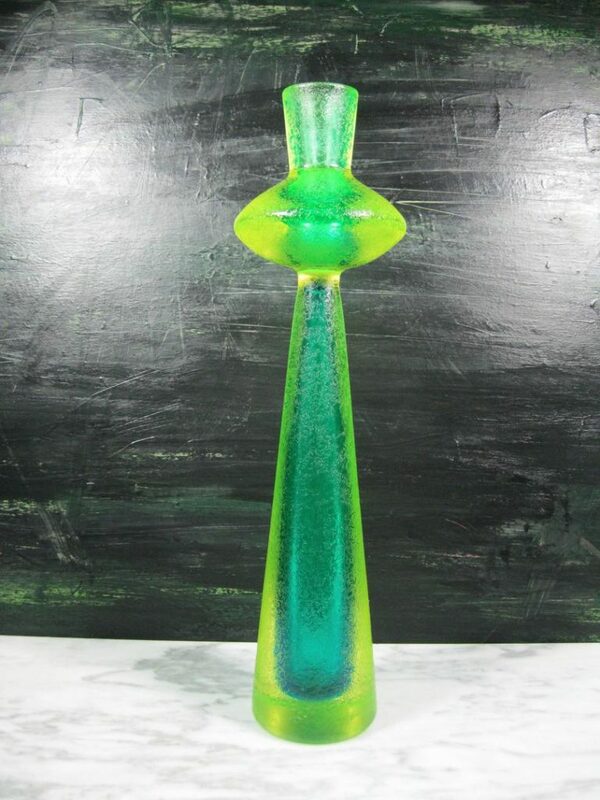 According to the Worthopedia, the highest recent auction price was for an Alfredo Barbini sculpted uranium Vaseline glass candlestick that auctioned for $11,995 in 2017. A pair of uranium glass urns sold at auction for $3,000 in 2016. Neither piece was dated in the description, but Barbini worked as a master glassblower in the 1940’s and 50’s. A Nymphen table tray by Walther & Sohne of Germany is dated about 1931 and sold for $795 in 2013. 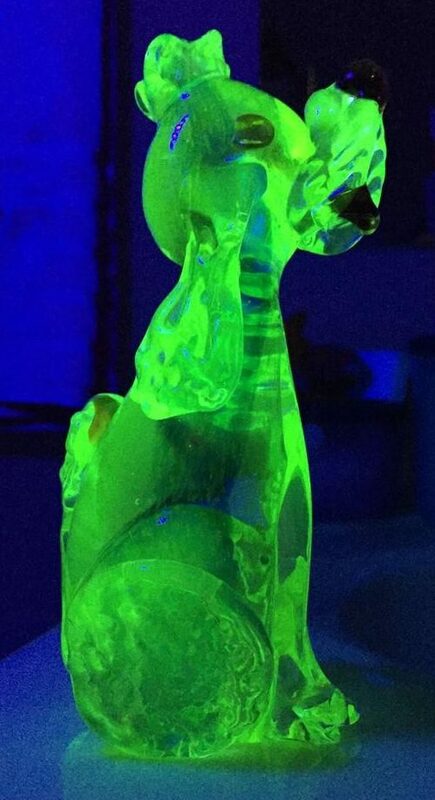 A beautiful uranium glass poodle by Murano had a small chip on its foot and sold at auction for only $25 in 2015. On the other hand, a uranium glass poodle by Murano sold at auction for $25 in 2015, while a glass pitcher sold for $45 in 2014; again, neither was dated in the auction description. Speaking of teacup, this cup and saucer of uranium glass sold for $15 and was described as Depression glass. You can also wear uranium glass with this sterling silver glass ring valued at auction at $35 in 2016. Storing food is possible with a uranium glass food storage box for the refrigerator that sold for $15 in 2016. Just a few ideas of utilitarian items and more decorative items created from uranium glass. An interesting side note about uranium glass from the article by Ben Marks is that when candle light or kerosene lamps were primarily used for household lighting, uranium glass did serve as a sort of extra lighting without the extra cost. With the invention and wider use of the electric light bulb in the early 20th century, uranium glass went out of favor as a “must have” household decorative and utilitarian item. Such is progress. 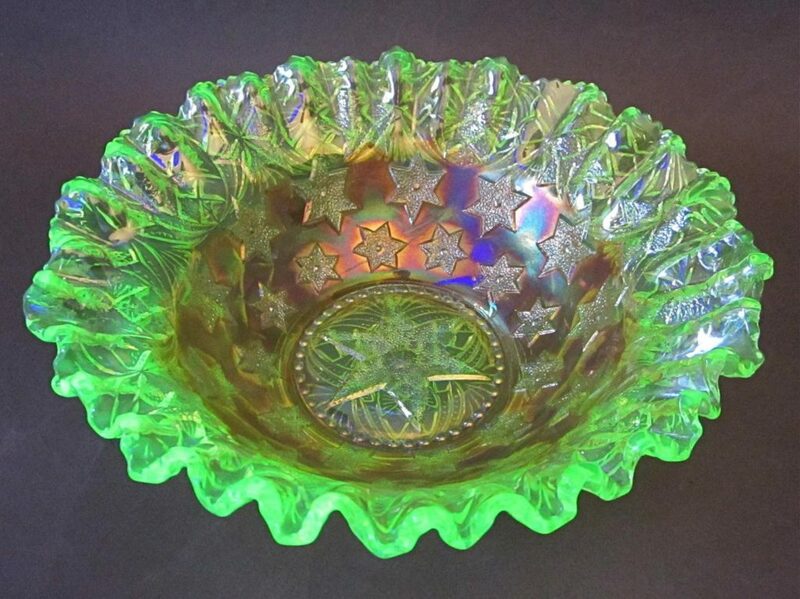 To learn more about uranium glass and the companies that produced them such as Fenton, Fostoria, Westmoreland, Hobbs Brockunier & Co., Northwood, and Cambridge Glass Company, among others, visit the Vaseline Glass Collectors website or read more from an Ebay blog Vaseline Glass? What All Collectors Should Know First. Collecting uranium isn’t just for the world’s superpowers anymore. It seems you can join the nuclear club, too.